HAVE YOU THOUGHT ABOUT DIRECTV IN THE PAST? TOWN SQUARE WILL SWEETEN THE DEAL. Receive HD programming, exclusive access to the NFL SUNDAY TICKET, and an unparalleled experience while watching your favorite movies and shows. Right now, when you call Town Square and set-up new DIRECTV service we will send you a $60 Visa™ gift card*. Think about it, with the $29.99 offer from DIRECTV**, it’s like getting your first two months of TV service for free! Not to mention, DIRECTV is offering NFL SUNDAY TICKET at no extra cost with CHOICE™ package and above when you sign up before 1/2/2016. * What’s not to like? *To access DIRECTV HD programming, HD equipment req’d. 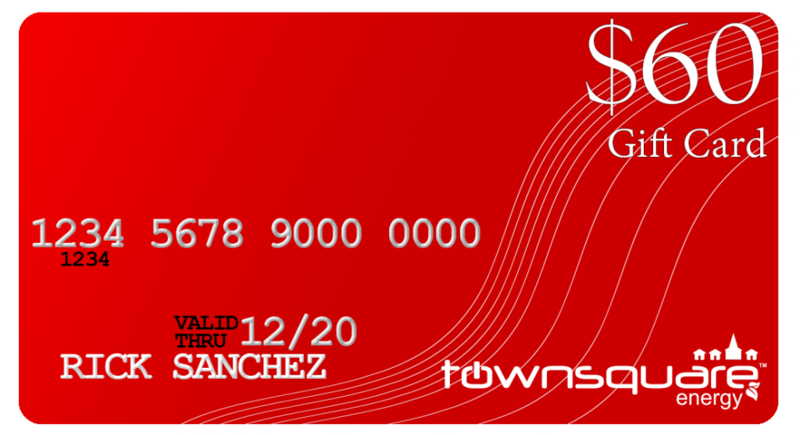 The $60 gift card offering from Town Square Energy will be sent via USPS to the mailing address on file when a new account has been confirmed for service from DIRECTV. Cannot be combined with any other offer. You must be a current Town Square Energy customer to receive this offer. For any questions or details regarding this offer please contact a Town Square Rep at 1-877-430-0093 M-F 8a-8p EDT. 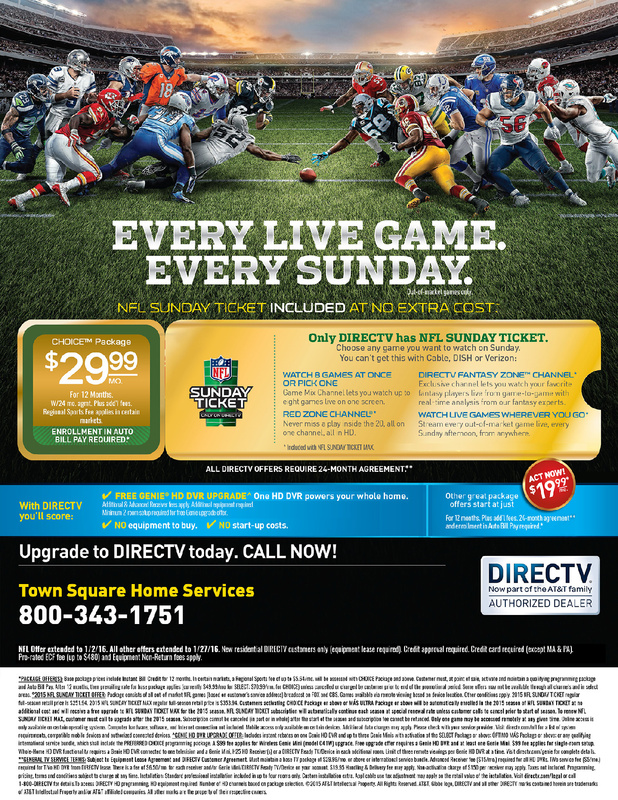 Town Square Energy is an authorized partner of DIRECTV. ALL DIRECTV OFFERS REQUIRE 24-MONTH AGREEMENT. REQUIRES ENROLLMENT IN AUTO BILL PAY. NFL Offer extended to 1/2/16. All other offers extended to 1/4/16. New residential DIRECTV customers only (equipment lease required). Credit approval required. Credit card required (except MA & PA). Pro-rated ECF fee (up to $480) and Equipment Non-Return fees apply. *PACKAGE OFFER(S): Base package prices include Instant Bill Credit for 12 months. In certain markets, a Regional Sports fee of up to $5.64/mo. will be assessed with CHOICE Package and above. Customer must, at point of sale, activate and maintain a qualifying programming package and Auto Bill Pay. After 12 months, then prevailing rate for base package applies (currently $49.99/mo for SELECT; $70.99/mo. for CHOICE) unless cancelled or changed by customer prior to end of the promotional period. Some offers may not be available through all channels and in select areas. °2015 NFL SUNDAY TICKET OFFER:Package consists of all out-of-market NFL games (based on customer’s service address) broadcast on FOX and CBS. Games available via remote viewing based on device location. Other conditions apply. 2015 NFL SUNDAY TICKET regular full-season retail price is $251.94. 2015 NFL SUNDAY TICKET MAX regular full-season retail price is $353.94. Customers activating CHOICE Package or above or MÁS ULTRA Package or above will be automatically enrolled in the 2015 season of NFL SUNDAY TICKET at no additional cost and will receive a free upgrade to NFL SUNDAY TICKET MAX for the 2015 season. NFL SUNDAY TICKET subscription will automatically continue each season at special renewal rate unless customer calls to cancel prior to start of season. To renew NFL SUNDAY TICKET MAX, customer must call to upgrade after the 2015 season. Subscription cannot be canceled (in part or in whole) after the start of the season and subscription fee cannot be refunded. Offer extended through 1/2/16. May not be combined with other DIRECTV offers, including refer-a-friend program. ^GENIE HD DVR UPGRADE OFFER: Includes instant rebates on one Genie HD DVR and up to three Genie Minis with activation of the SELECT Package or above; ÓPTIMO MÁS Package or above; or any qualifying international service bundle, which shall include the PREFERRED CHOICE programming package. A $99 fee applies for Wireless Genie Mini (model C41W) upgrade. Free upgrade offer requires a Genie HD DVR and at least one Genie Mini. $99 fee applies for single-room setup. Whole-Home HD DVR functionality requires a Genie HD DVR connected to one television and a Genie Mini, H25 HD Receiver(s) or a DIRECTV Ready TV/Device in each additional room. Limit of three remote viewings per Genie HD DVR at a time. Visit directv.com/genie for complete details. ◊GENERAL TV SERVICE TERMS: Subject to Equipment Lease Agreement and DIRECTV Customer Agreement. Must maintain a base TV package of $29.99/mo. or above or international service bundle. Advanced Receiver fee ($15/mo.) required for all HD DVRs. TiVo service fee ($5/mo.) required for TiVo HD DVR from DIRECTV lease. There is a fee of $6.50/mo. for each receiver and/or Genie Mini/DIRECTV Ready TV/Device on your account. $19.95 Handling & Delivery fee may apply. Non-activation charge of $150 per receiver may apply. Taxes not included. Programming, pricing, terms and conditions subject to change at any time. Installation: Standard professional installation included in up to four rooms only. Custom installation extra. Applicable use tax adjustment may apply on the retail value of the installation. Visit directv.com/legal or call 1-800-DIRECTV for details.To access DIRECTV HD programming, HD equipment required. Number of HD channels based on package selection. ©2015 AT&T Intellectual Property. All Rights Reserved. AT&T, Globe logo, DIRECTV and all other DIRECTV marks contained herein are trademarks of AT&T Intellectual Property and/or AT&T affiliated companies. All other marks are the property of their respective owners.